John Wilkes Booth, and his accused co-conspirators, Mary E.Surratt, Dr. Samuel A. Mudd, David E. Herold, G. Andrew Atzerodt, Lewis T. Powell (Paine), Samuel B. Arnold, Michael O'Laughlin, Edman Spangler, and scores of others, like John H. Surratt, Jr. and George N. Sanders, who got away . . . a different account about the assassination of President Abraham Lincoln. An old, albeit sexist, Celtic maxim probably says it best. Each man is actually three entities in one: what others think he is, what he thinks he is, and what he really is. 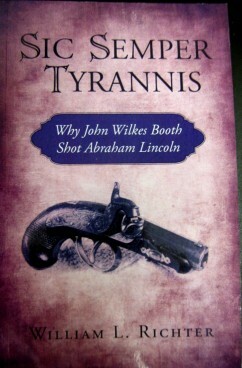 We all know what we Americans think of John Wilkes Booth. He was the craziest of what one biographer of the Booth family called the "Mad Booths of Maryland." That has been his thumb-nail sketch among most Americans, now or in the past. Joseph H. Bradley, Sr., a counsel defending Booth's compatriot and accused co-conspirator, John H. Surratt, Jr., two years after the assassination of Abraham Lincoln, characterized John Wilkes Booth as "[o]ne whose name and reputation will go down to the latest times in this country associated with the most atrocious assassination ever committed." A mite extreme, to be sure, but Bradley can be excused. He was trying to keep John Surratt from suffering the same fate as his mother (a convicted Booth co-conspirator), death by hanging. To save his client, Bradley laid the whole blame for the killing of Lincoln at Booth's feet. Surratt had to appear as untainted as the driven snow. It worked. The jury could not reach a verdict, and hung on sectional lines, Yankees and foreign-born voting to convict, Southerners voting to exonerate. The government gave up further prosecution. "Let us at least hope that at the bar of that offended God to which he has gone," Bradley prayed, "there will be found some mitigation of his offense. Let us hope at least that his mind was unhinged from its reason, that he had become in the strictest sense such a fanatic as not to appreciate the enormity of the act which he contemplated and committed." After years of wandering in the wilderness of Lincoln assassination literature, it was with great pleasure and gratitude that this weary pilgrim came upon the refreshing oasis of William L. Richter’s, The Last Confederate Heroes. Although classified as fiction, this two volume novel is a rarity due to the depth of research he has put into his work. The cast of characters, all of them historical figures, that move in and out of the drama surrounding the Lincoln assassination is as vast as it is varied, and Richter has not stinted in his use of all the players, whether they be at center stage or in the wings. In his book, Richter makes good use of and builds upon the thesis presented in the ground breaking work, Come Retribution, in which authors William A. Tidwell, James O. Hall and David Winfred Gaddy make a solid case (using documentary evidence and following the trail of secret service funds) of the involvement of the Confederate Government and their agents in the elimination of President Lincoln. Prior to the release of Come Retribution, many historians, scholars and assassination aficionados scoffed at the idea that the killing of Mr. Lincoln was anything more than the result of the evil scheme of a deranged, out of work actor who loathed the “Great Emancipator” as a tyrant and had vowed to do away with him for destroying the Southern way of life and freeing the slaves, and that John Wilkes Booth, along with his mismatched gang of sycophantic misfits, mental incompetents, drunkards and ne’er-do-wells encompassed the entire scope of the conspiracy. Before he was hanged, Lincoln assassination conspirator Lewis Powell told federal officers, referring to the considerable number of those involved in the actions against the person of Mr. Lincoln, that they had not yet gotten the one tenth of those involved. In their arrogance, and ignorance, the federals most likely believed that Powell just had an imperfect understanding of mathematics. Although federal authorities did, in fact, have more than one tenth of those directly involved in the actions against Mr. Lincoln, (but for a lack or loss of evidence not much of a case could be made against most of them) it would have been difficult, at the time of the Lincoln Assassination, for federal authorities to fully comprehend the degree to which the plans against the Union President extended. They most likely would have been overwhelmed not only by the various plans of action against their President, but by the numbers of those involved in the planning and implementation of those actions. But, “There are more things in Heaven and earth, Horatio, than are dreamt of in your philosophy.” (Hamlet, Act 1, Scene V). Lewis Powell understood these sentiments perfectly, and so too, does William Richter. 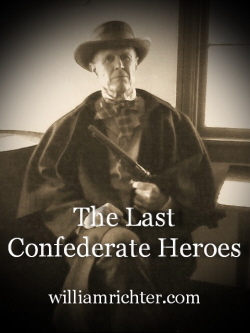 With The Last Confederate Heroes, he demonstrates clearly that there is much more in Heaven and earth than has ever been dreamed of by Lincoln assassination historians. Using a wide variety of source materials for his novel, which include papers from private collections, historic periodicals, personal memoirs and firsthand accounts from those on the scene, period newspapers and modern documentaries, the author casts a wide net and draws into his work not only those known figures that have always been associated with the Lincoln assassination, but also those not so well known participants who dwell on the periphery. But he does much more than introduce us to new and interesting personalities; Richter puts the flesh on their bones and, writing in an honest, unapologetic, straight-ahead style, with an ardent feeling and understanding of the time, which can only be described as intuitive, he draws us into their world. And once entered, the world of The Last Confederate Heroes is one from which the reader will be reluctant to depart and one to which he will desire to return time and again. The reader will find himself walking the streets of Washington City with the likes of John Wilkes Booth, John H. Surratt and David E. Herold; sitting in on meetings at the Confederate White House in Richmond in company with Jefferson Davis, James Seddon and Judah Benjamin as they discuss the plans of action against President Lincoln; at the bar of the St. Lawrence Hall Hotel in Montreal sipping a “bourbon and branch” with George N. Sanders, Charles Dunham and other operatives of the Confederate clandestine apparatus in Canada; with Confederate agents Thomas Jones, Thomas Harbin and Elizabeth Quesenberry (pronounced, “Kwee-sen-berry”, and she was most insistent on that point) as they make efforts to move Booth down “The Line”. Through his painstaking research, Richter also presents us with something else that other historians have failed to do thus far by not writing within the context of 19th Century America; the author has given us the only comprehensive, in-depth analysis of John Wilkes Booth’s political philosophy, showing that Booth was very much a man of his time. In its original form, The Last Confederate Heroes was comprised of 920 pages in two volumes. 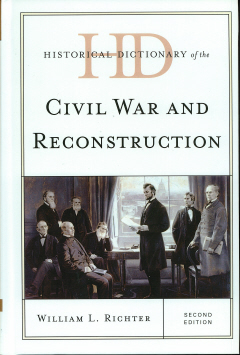 The revised edition has been infused with new material gained from the author’s most recent research and is now, in its present form, overall, the finest, most comprehensive work of Lincoln assassination literature to date, bar none. Richter has done something that few other novelists have done--extensive home work. 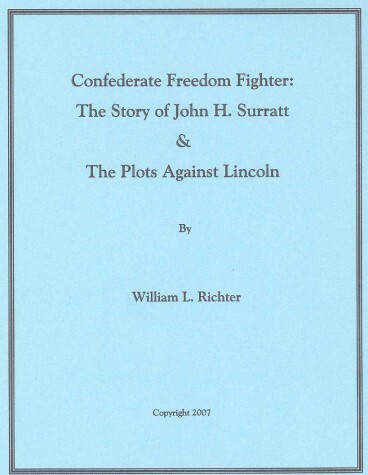 Rather than create a fictional world and spin incidents created from a whole cloth, Richter has taken a generation of Boothie research - much of it published in the pages of the Surratt Courier - and overlaid it with the ideas put forth in Come Retribution, in an attempt to put the assassin and his ilk in perspective. He uses the 920 page, two volume set to explore the life, beliefs, and deeds of Booth from boyhood to his death or the plotter who tried to defeat the Yankee juggernaut and save the Confederacy. The is really more Fact in this novel than in many supposed histories published on the subject. Fleeing south after shooting President Lincoln, John Wilkes Booth was cornered in a barn in Virginia and mortally wounded when he refused to surrender to pursuing federal cavalrymen. His death hours later denied the nation a trial that might have revealed his motives and possible links to the Confederate government. 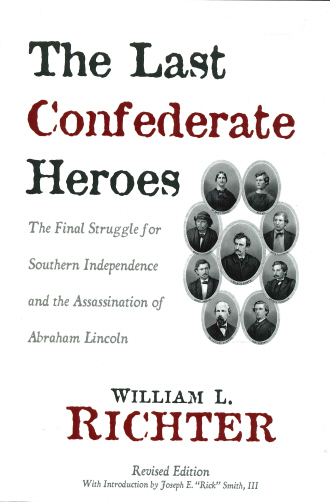 In this riveting tale, historian William L. Richter continues his study of what Booth believed he was accomplishing in figuratively firing the last shot of what the South called the War for Southern Idependence. The reader is taken through the trial where Booth is prevented from testyfying on his own behalf under the rules of law in that time. Never one to take second billing, the actor turned avenger manages to smuggle his version of events out of the Washington Arsenal prison and into the pages of the national press before the trap on the scaffold drops to put the end to this "what if" episode in American History. 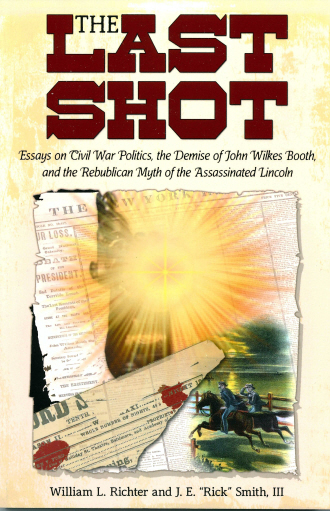 The "Last Shot" is a compilation of ten essays that deal with the subjects and unsolved mysteries surrounding the Civil War. The most controversial is the notion of whether the North intentionally caused the confict as the only way to abolish slavery. Did they misjudge the Southern response due to years of the South making threats and not carrying them out? 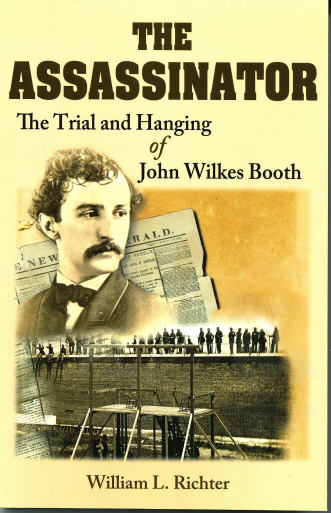 Several essays look at John Wilkes Booth, the people who influenced him, and those who aided in his escape after he shot President Abraham Lincoln. Did Booth's escape route differ from the accepted tale? And did Booth commit suicide at Garrett's Farm? Finally, the book examines the Republican Party's successful drive in Congress for political supremacy over the Executive Branch and the Supreme Court, before, during, and after the war. From Richard Lawrence to John Wilkes Booth to John Hinckley, Jr., Americans have preferred their presidential assasins, whether failed or successful, to be more or less crazy. Seemingly, this absolves us of having to wonder where the American experiment might have gone wrong. John Wilkes Booth has been no exception to this rule. But was he? In a new, provocative study comprising three essays, historian William L. Richter delves into the psyche of Booth and finds him far from insane. Beginning with a modern, less adulating interpretation of President Abraham Lincoln, Richter is the first scholar to examine Booth's few known, often unfinished speeches and essays to draw a realistic mind-picture of the man who so intensely believed in common American polital theories of his day, and acted violently to carry them out during the time of America's greatest war. 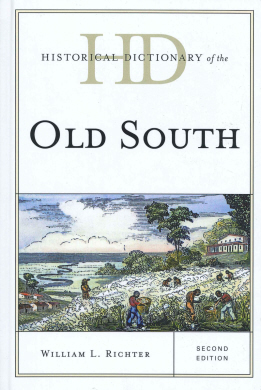 To better understand the Old South, we must look back at its origins and customs. Considerably different from other regions of the country and with slavery in its past, the land south of the Mason-Dixon Line is full of unique traditions and rituals. The region enjoyed an exceptional prominence in politics and, after the invention of the cotton gin, a high degree of prosperity. However, because of slavery, it was alienated from the rest of the nation, attempted to secede from the Union, and was forced back in only after losing the Civil War. Historical Dictionary of The Civil War and Reconstruction, with more than 800 entries covering the significant events, persons, politics, and economic and social themes in the U.S. Civil War and Reconstruction Period, is a research tool for all levels of readers from high school and up. The extensive chronology, introductory essay, and comprehensive bibliography introduce and lead the reader through the military and non military actions of one of the most pivotal events in American history. Thomas H. Harbin created the so-called Secret Line used by Confederate couriers to transfer personnel, information, and orders between Richmond and its operators in the North and in Canada. Because of his position, Harbin became involved in coordinating John Wilkes Booth's recruitment activities for his abduction plots against Lincoln. Later when the kidnap plots turned to assassination, Harbin assisted Booth and others to escape, at least temporarily, the Yankee juggernaut that sought to capture and punish them. Afterward, Harbin managed to flee through Cuba to exile in England. He returned to the United States in 1867 after the Federal government's failure to convict Booth co-conspirator John Surratt in a well-publicized jury trial indicated to him that he would be more or less safe from prosecution. Harbin served as chief clerk at the national Hotel in Washington until his death. Shortly before he died, he gave an interview to the famous Civil War-era newspaperman and Lincoln Assassination investigator, George Alfred Townsend, who wrote admiringly about Harbin's wartime activities in several articles. John H. Surratt, Jr., became the right-hand man of John Wilkes Booth in his plots against Lincoln. It was Surratt who recruited much of Both's gang. His mother ran the home base, while her son traveled between Richmond, Washington, New York and Montreal, Canada, carrying dispatches for the Confederate government coordinating its behind-the-lines operations during the Civil War, many of which emanated from across the Canadian border. 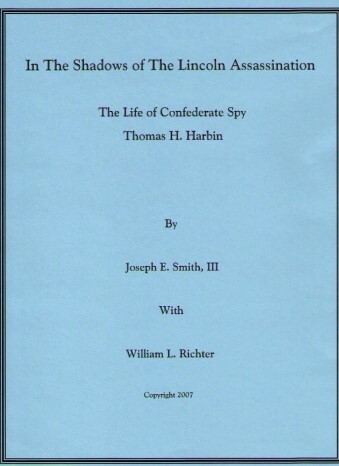 This said, the reader is reminded that the abduction and ultimate assassination of Abraham Lincoln and important members of his administration, with which John Surratt was involved as Booth's subaltern, was merely one part of a well-financed secret service campaign in 1864 and 1865. That John Surratt and his fellow operatives bungled many of their efforts in the field does not lessen the hoped for results of the planners. Booth sought to mitigate his and others' prior failures by carrying out the plan to destroy Lincoln and his cabinet by striking at select members and the President as individuals, all at the same time. Surratt us important because he was the one that got away. He managed to avoid a lengthy prison sentence or execution, something that eluded his mother and the others in the Booth gang.